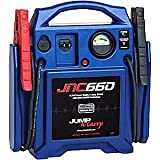 Portable jump starters can be a lifesaver in cold climates or emergency situations if your car battery has run down and you can't jump start from someone else's car battery. This buying guide will help you select the best jump starter. 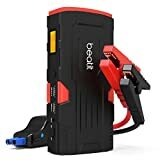 Plug-in jump starters and chargers: These kinds of chargers provide between 2 and 10 amps of electric current that charges up your car battery slowly. Some battery chargers have a “start” button that can start the engine immediately if the battery is not completely dead. 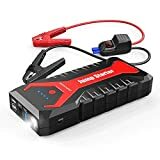 The increased charging time required by this kind of jump starters may not always be convenient, but it is better for your battery in the long run. Jump boxes and portable power packs: A jump box consists of a small plastic box containing a battery that is permanently attached to jumper cables. Jump boxes are not meant for charging a dead battery. However, they are capable of jump-starting a car with a completely dead battery. They are portable and are good for emergency situations. Warranty: As with all electrical products, most prudent users stress a genuine warranty. Products with a longer warranty are sure-shot winners. 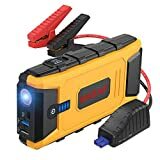 Reliability: After going through thousands of jump starter reviews, it is clear that most users prefer products manufactured by well-known brand names. Check the battery type: Most vehicles work on a 12 Volt battery, but some garden tractors and cars might have a 6 Volt battery. 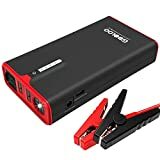 You should buy a jump starter that matches your battery type. Check the peak amps and cranking current: Peak amps are the maximum current that the jump starter can produce in the initial burst. Often, your car may refuse to spring back to life with the initial burst. In such situations, the electric current produced by the jump starter drops to a more stable level, called the cranking current, that continues to crank your battery. Therefore, you need to consider the cranking current that your jump starter can deliver. Prepare for extreme conditions: If the temperature drops below 20-30 °F, the efficiency of your car battery is reduced by half. The jump starter battery is also affected by such extreme temperatures. 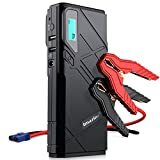 Although the decline in efficiency may be less for jump starters using lithium-ion batteries than those using lead-ion batteries, you would be better off selecting a jump starter that produces double the cranking current of the normal requirement of your engine. 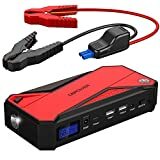 Purchase a jump starter with the highest peak and cranking current rating that you can afford. Go for easy charging: Most of the current models have a built-in AC cord that can be used to recharge the device. You must ensure that the jump starter is capable of charging itself from the ports available on your vehicle. Check the clamps: Well-insulated, heavy-duty clamps are a must to prevent shocks. Check the cable Length: The length of the cable allows you the flexibility to place your jump starter conveniently. 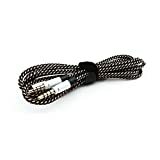 A minimum of three to four feet of cable should be your aim. 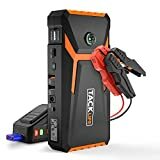 Check for additional features: Some jump starters come with extra add-ons such as multiple ports for charging devices, a built-in radio for weather forecasts and an air compressor. 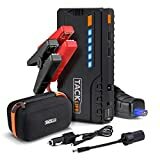 Check if you need any such accessories along with your jump starter. Short circuit protection: Short circuits can be very dangerous, as they may lead to causing the battery to explode within the jump starter. Although most jump starters come with this minimum safety requirement, you can never be too sure. Over-current protection: This safety feature ensures that the jump starter does not deliver more than the peak current limit to your vehicle’s engine. Overload protection: This auto cutoff feature protects the jump starter during charging. It blocks currents higher than the manufacturer’s specified maximum, so as to prevent damage to the unit. Over-voltage protection: This feature protects the unit from voltage fluctuations during charging. Overcharge protection: Overcharging the jump starter battery may damage it. An auto cut-off feature protects the jump starter battery from damage due to overcharge. PowerAll - is an industry-leader in its own right. The jump starters manufactured by this brand are very popular among customers. Clore Automotive - is one of the leading manufacturers of jump starters. The quality and durability of their products speak for themselves.